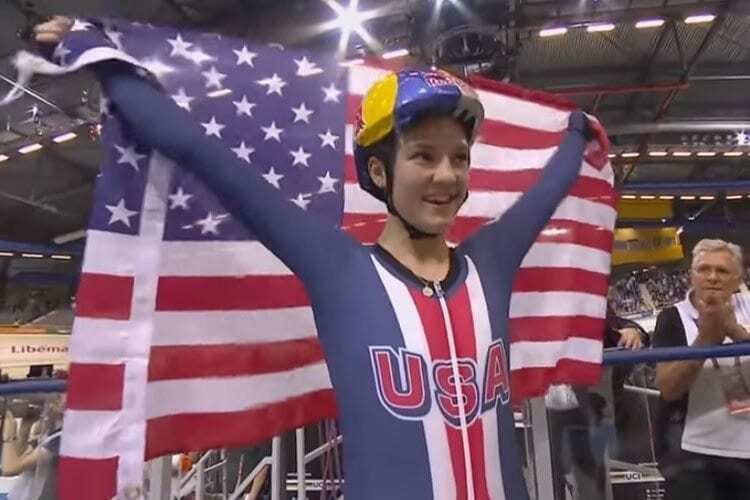 Watch as Chloe Dygert-Owen (Sho-Air TWENTY20) becomes a World Record Holder after breaking former teammate Sarah Hammer’s Individual Pursuit record by over 2 seconds with a time of 3.20.060 at the UCI Track World Championships in Apeldoorn, Netherlands. Rally Cycling’s Kelly Catlin helped Team USA defend their world title in the team pursuit this past weekend at the UCI Track Cycling World Championships in Apeldoorn, Netherlands. Catlin and her teammates Jennifer Valente, Chloe Dygert and Kimberly Geist narrowly edged out defending Olympic champions Great Britain. Catlin also took bronze in the individual pursuit. “Defending the world title was very special,” said Catlin. “Our team has been training extensively to improve our team pursuit technical skills, and winning in the Netherlands is proof that we are on the right track for the Tokyo Olympics.” The team pursuit event is four kilometers in length, consists of four riders per team, and takes just over four minutes to complete. With no brakes and only one gear, the mindset is simple for Catlin.